Refinishing is the removal of old degraded finish and the application of a new finish. I will always remove old finishes by hand, using stripping chemicals as this is far less destructive than sanding. The wood may then require removal of any stains and then often needs some colouring to bring it back to life. The piece will then be refinished. 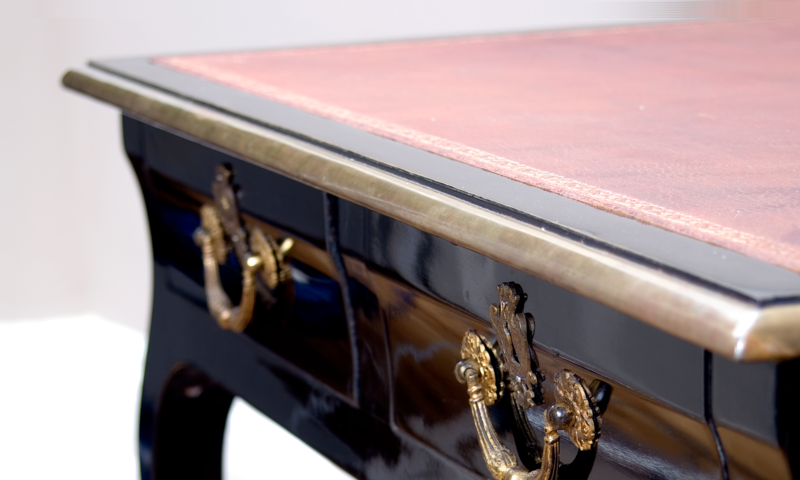 The techniques and types of finishes used will be dependent on the age and style of the piece. The drop leaf table pictured was hand stripped with chemicals before being stained and french polished by hand. The Heals office desk below was heavily worn from daily use. It had been finished with a spray lacquer which had degraded over time. The colour had faded and the beige leather had become worn. The damaged finish was removed and the wood stained to match the rest of the piece. It was then refinished. The worn leather was removed and replaced with new leather matching the old colour.